The Can Can Dance music is a famous extract from the French opera of 1858, Orphée aux enfers, or Orpheus in the Underworld. Controversial at the time, the music was written for Act II, Scene II, when the Gods who were partying in hell, throw themselves into the Gallop Infernal. As the music became famous outside of Operatic circles, the name Can Can was applied to the tune. The music itself was borrowed, slowed and used by Saint-Sans in the musical suite Le carnaval des animaux, or The Carnival of the Animals. By slowing the music tremendously and adding strings, Saint-Sans used the music to represent the tortoise in the fourth movement. However maddening, The Carnival of the Animals, in its entirety, was a complete success, and more recently was transformed into a ballet. With narration written by John Lithgow, Christopher Wheeldon's ballet of the same name premiered on May 14, 2003 at New York State Theater, Lincoln Center. 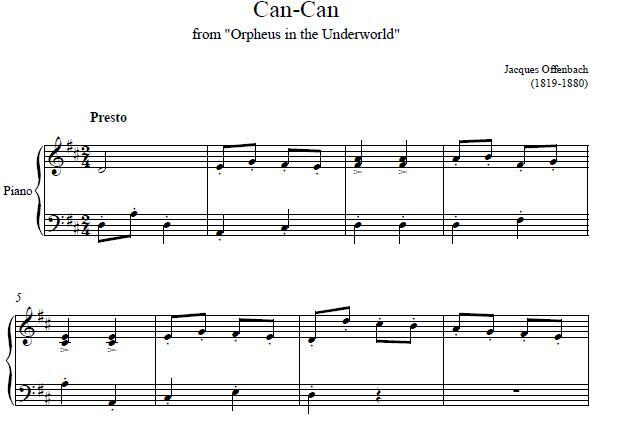 More free sheet music in different genres can be downloaded from our sheet music collection.